Last winter, I released a pattern set – the Maribel Cowl & Boot Cuffs. They are still some of my favorite patterns from that season, and based on the stats, you loved them, too! Scroll down for the free pattern. Hope you like it! Using I Hook, and leaving a 12" tail, CH27. Don't weave in the tail until instructed (we'll use it later to cinch the hat). Edging: CH1, turn. SC evenly around the entire project, putting (SC, CH1, SC) in each corner. Fasten off, leaving a 12" tail. Turn your hat inside out. Thread your starting tail through the yarn needle and weave it in and out of every other SC along the top edging of the hat. (I've highlighted my yarn needle in yellow in the photos below.) 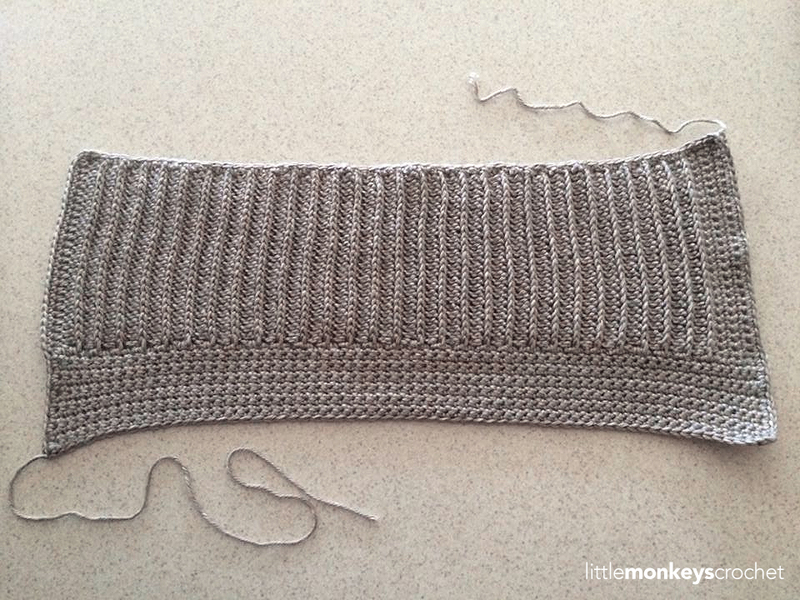 When you're done, pull it tight to cinch the hat (but carefully... you don't want to break the yarn!). Use the yarn needle to reach across the cinch a few times to make sure it's closed up nice and tight, then make a knot and weave in the tail. Turn your hat right side out. Oh my, another lovely hat!! I love it! I am so appreciative that you have made every one of them free. They are so stylish, absolutely beautiful. Thank you, thank you! Your designs are superb! I love the slouch hat pattern. tried to print it out but your print factor doesn’t work. Beautiful! I love these patterns and thank you for your generosity in sharing them. Your hat is beautiful and so are you ! Hi…first l want to thank you for all your free patterns. I love your work and follow you.l have used many of your patterns with success. ? I have a question about this particular pattern. I lost count of my rows.The pattern says 64 rows l think.Could you approximate around how many inches long it should be? Thank you in advance. ???? love this hat, and many other items from you. thanks. Lov this hat! Im more than half done, and curious what dimentions are when laid flat before attaching sides? Also the sc rows at the beginning of the pattern are turning out longer than the half double crochet rows. 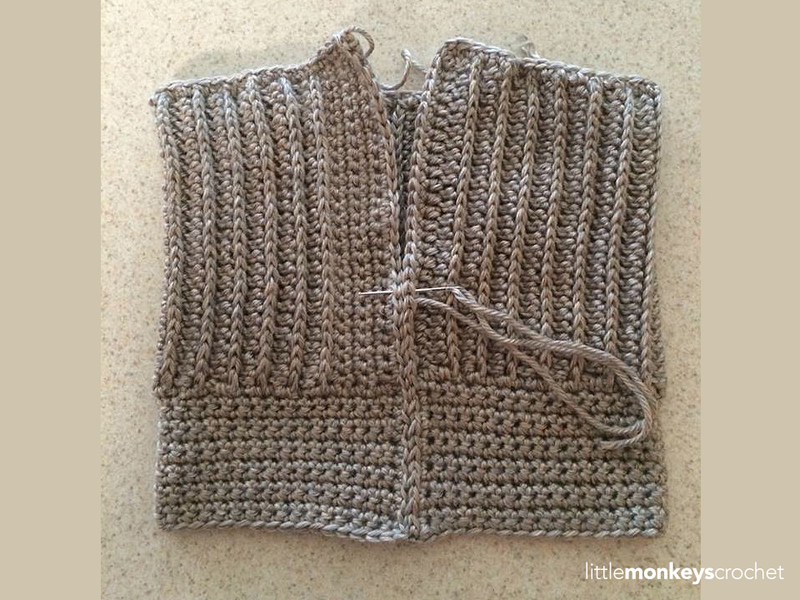 Should I use a larger hook for half double crochet rows. Yes, I’m sorry — I usually include “when laid flat” on my measurements, but forgot to this time. 🙂 Lay it flat, and the band should be about 9.5″. Regarding the SC rows, I had the same issue but it worked itself out fine when I seamed it up, because there are still the same number of stitches. If it’s bugging you, I would suggest going down a hook size for the SC, instead of up a hook size for the HDC, because the HDC is the bulk of the hat and that will affect the overall size more. Love the buttons on this hat! I love this pattern. I made two of them. This is my favorite of all your slouch hats. I love all the buttons! This looks so cute. Can’t wait to make it. Love this one! Will have to add it to my project list! This pattern was fun and easy to make for my soon to be daughter-in-law as a Christmas gift. I made it in a deep purple. I love the buttons that add interest, too! Love the detail on this hat! It’s gorgeous! I love the style of this hat! And the easy to follow instructions are great, too! Hi i absolutely love this hat! I just finished it and to my disappointment it is not long enough to actually slouch. It fits exactly like a beanie on my head and i have a small head. And im not sure what i did wrong. All of my stitches are there. Kinda sad…. now have to attempt all over. My guage was good. And my yarn is medium. Any thoughts? If your gauge was right on, then I’m not sure what the problem would have been. It sounds like you’d definitely need to add to your starting CH if you attempted it again. I really love this one, it’s really pretty ! You are so talented! I love slouchys. I made 3 of the Maribel. I’m already planning on making the matching cuffs. Thank you for such wonderful designs!! 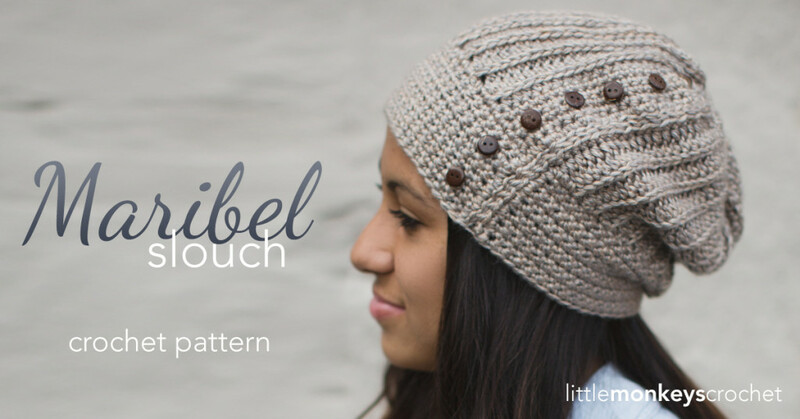 Love the Maribel Slouch with the buttons! I love the fact that this hat is crocheted flat and then sewn together. Great pattern! Love this hat, and so do my customers!! Hello i was tryning to do the maribel hat.i was having problems with the ribs stiched on the ends… its not adding to 26…. Without seeing what you’re doing, it’s hard to know what to tell you. I can tell you that this hat has a 1:1 stitch ratio – meaning with each new row, you’ll put one stitch in each stitch from the previous row. So if you’re coming up with less than 26 stitches, you’re missing stitches somewhere. I just finished this hat and it came out so beautiful. Very easy instructions to follow. Thank you for making your patterns free to the public. They are truly beautiful works once completed. The sandy slouch has been my go to favorite but I think this is my new fave!! I just LOVE this hat. I have never crocheted one before but I’m Definetly going to give this a try. I just finished adding 3 buttons on my hat. I love this pattern, my daughter said “wow mom it looks store bought”… I’ll take that as a compliment. Thank you for sharing this pattern and all your other patterns. I absolutely love all your patterns! Thank you for sharing them for free. You have a unique gift! If I wish to make your Maribel slouch hat as a beanie instead, how many chain stitches would you suggest I start with to make an adult female size hat? I’m not sure, you’d need to look at a size chart and determine from there. Rebecca, how do you keep your rows so even on the edges? Mine are not! I have looked on videos and am not finding the answer. Thanks! Didn’t receive instructions for downloading pdf. May have been sent to an old email address.